Read the brief history of the African-American holiday of Kwanzaa, detailed on this printable. This holiday celebrates African heritage and traditions and is a great way for students to expand their understanding of other cultures. Browse a multi-page, printable resource of ready-to-use lessons and cross-curricular activities about African American history and culture. 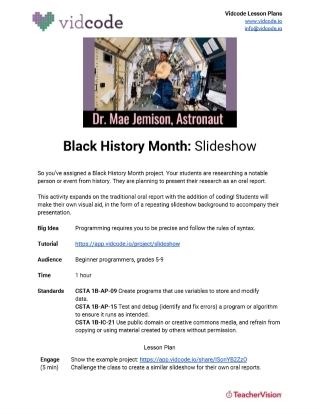 Hour of Code: Code a Slideshow for Black History Month!